A 360° turn that throws away the opponents, a scorching pass ripping through the defence, the bicycle kick, a flying header, and of course, thousands of screaming fans — what else can it be but “jogo bonito” — the “beautiful game”? Football is by far the most popular sport in the world — estimates show that the game has around 3.5 billion fans. Across Latin America, Europe, Asia and slowly entering North America as well, football unites and divides people the way probably no other sport can. This passion for the sport has driven a group of scribes to bring out “Tiro: A football Odyssey from Amazon to Alps” — a collection of essays chronicling the various facets of the game over the past century. Interestingly, all the writers are Bengalis. For the uninitiated, West Bengal, the eastern state of India, has the most storied tradition of football in the country. India, while known more for its cricket and hockey teams, was nonetheless a major regional power in football up to three decades ago, with players from Bengal right at the top of the ladder. The nation reached the fourth spot at the 1956 Olympics and has won two gold medals at the Asian Games. “Tiro” (which means shot or kick in Spanish) begins — well, where else? The land of Pelé, Garrincha, Ronaldo, Kaka and the current Neymar. Brazil has achieved almost mythical status in football, with five World Cup titles under its belt. But it is equally remembered for its tragedies — the debacle in the 1950 finals, the untimely end to its 1982 campaign, in what was termed as the best team never to have won the Cup, and the most recent — the humiliation in the 2014 semis against Germany. We also read about the tragic life of Moacyr Barbosa, the goalkeeper in the 1950 World Cup, who’s otherwise glittering career remained marred by this one match. Staying in the continent, the rivalry between Argentina and Uruguay receives a lot of attention. Also, we get to know about football culture in countries such as Peru, Bolivia, Chile and Colombia, nations with a chequered tradition in the game at the regional levels, although they may not have too many successes to show at the World Cup. Personalities make for a bulk of the writings in the book. Across continents, several names come up, which the average football fan might not even know of, but all the same have been immensely popular during their times. Prominent among these is Carlos Caszely, a Chilean whose career and even life were on the balance as he refused to shake hands with the country’s then-dictator, Augusto Pinochet. But is football merely a sport? Not so. The game is intrinsically linked to the social and political situations of the countries themselves. Thus we read about the influence of the Argentine gang wars in that country’s club football and politics. We learn about the careers of several prominent players whose careers were affected by the independence movement in Algeria. The most tragic incident, probably, as related in the book, was the bombing of a football match in war-torn Sarajevo during the days of the ethnic wars after Yugoslavia was dissolved. 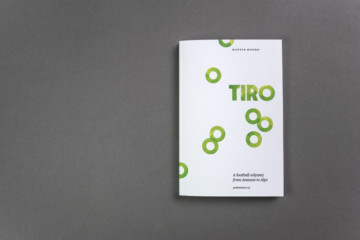 “Tiro” is essentially a book for the football fanatic. The writers, who run a website aptly called Goalden Times, have poured their heart and soul, literally, into the essays. If one overlooks the occasional weak language and editing, “Tiro” is worth a place on the bookshelf as a mini-collector’s item, a small encyclopaedia for the fans of the beautiful game.